"TVG: I know that Kasahara-san has experience of working on F-Zero GX; do you think there's any chance of a future collaboration between SEGA and Nintendo for another F-Zero game? OO: It might happen, if someone comes up with a brilliant idea that would make both Nintendo and SEGA happy. If there's a good idea, that will work for both of us, then we might do that. But as far as we know, we haven't heard of any concrete plan or project that's going on." Why do I get the feeling that just because Sega isn't working on F-Zero for Wii 2 doesn't mean that F-Zero isn't coming anyway? I think that Retro Studios has a higher chance of working on F-Zero than Eternal Darkness at this point. Retro succeeded with Donkey Kong Country Returns, why not bring back F-Zero while they're at it? 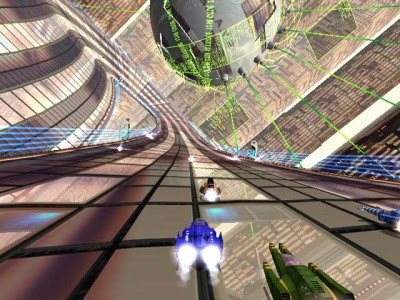 F-Zero GX exhibited such awesome collaboration between Nintendo and Sega.